Mass of Christian Burial for Jack Mahan, 93, of Groton will be 11:00 a.m., Wednesday, March 27th at St. Elizabeth Ann Seton Catholic Church. Father Mike Kelly will officiate. Burial will follow at a later date in Union Cemetery under the direction of Paetznick-Garness Funeral Chapel, Groton. 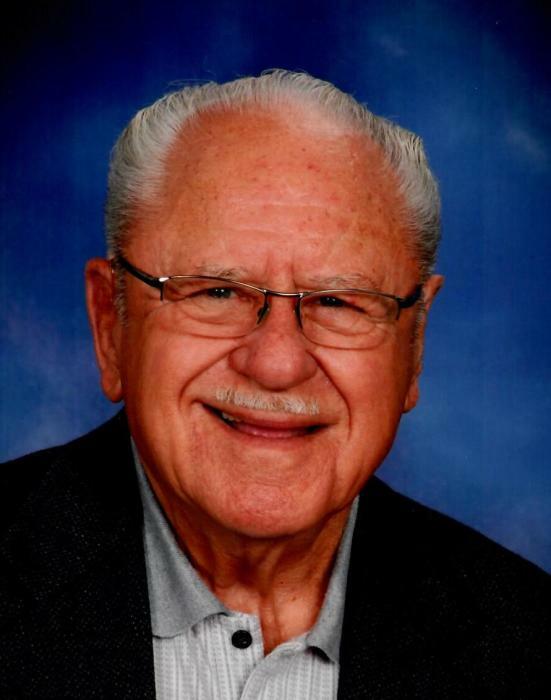 Visitation will be at the chapel from 5-7 p.m. on Tuesday with a wake service at 7:00 p.m.
Jack passed away March 20, 2019 at Sanford Aberdeen. Derrill J. "Jack" Mahan was born on August 16, 1925 to Floyd and Blanche (Fortin) Mahan in Waubay, SD. He grew up and attended school in Turton. On October 4, 1950 he was united in marriage with Marjorie Peterson and together they made their home in Groton. Jack began working for Bowles and Sour Motor Company of Groton in 1949. He became partner in 1961 and the business was later renamed, Pioneer Ford. Jack was part of the dealership for 65 years. Jack was a member of St. Elizabeth Ann Seton Catholic Church. He also belonged to the South Dakota Auto Dealers Association, Elks Lodge and was a charter member of Olive Grove Golf Course. He enjoyed reading and watching westerns, hunting and fishing with his family and friends. Jack also enjoyed the family cottage at Roy Lake for over 50 years. No one will ever forget how much he loved to sing and have a "bump." But his true love was always farming. Celebrating his life are his three children, Thomas P. (Alesa) Mahan of Groton, Kathy Sundling of Groton, John R. (Julie) Mahan of Helena, Montana, five grandchildren; Traci Sundling, Vince (Raeann) DeCuio, Dominic (Michelle) Mahan, Jason (Amanda) Mahan, Andrea (Steve) Foran, twelve great-grandchildren, two great-great grandchildren, his brother, Thomas C. (Mary Ann) Mahan of Keller, Texas and his nieces and newphews, Mike Mahan, Pat Mahan, Ellen Cogdill and Kim Guhin. Preceding him in death were his parents, his wife, Marjorie and his sister, Mertys Reese. Casketbearers will be Jim White, Jesse Howard, Steve Dunker, Bill McKiver, Matt Johnson and Greg Anderson.